The failure of neo-liberism: what’s the world’s future? Joseph Eugene “Joe” Stiglitz (born February 9, 1943) is an American economist and a member of the Columbia University faculty. He is a recipient of the John Bates Clark Medal (1979) and the The Sveriges Riksbank Prize in Economic Sciences in Memory of Alfred Nobel (2001). Former Senior Vice President and Chief Economist of the World Bank, he is known for his critical view of globalization, free-market economists (whom he calls “free market fundamentalists“) and some international institutions like the International Monetary Fund and the World Bank. In 2000 Stiglitz founded the Initiative for Policy Dialogue (IPD), a think tank on international development based at Columbia University. Since 2001 he has been a member of the Columbia faculty, and has held the rank of University Professor since 2003. He also chairs the University of Manchester‘s Brooks World Poverty Institute and is a member of the Pontifical Academy of Social Sciences. 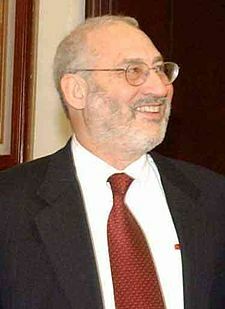 Stiglitz is the most cited economist in the world, as of June 2008. For Stiglitz there is no such thing as an “invisible hand“ . Whenever there are “externalities”—where the actions of an individual have impacts on others for which they do not pay or for which they are not compensated—markets will not work well. But recent research has shown that these externalities are pervasive, whenever there is imperfect information or imperfect risk markets—that is always. Stiglitz resigned a month before his term expired at the World Bank, and left the Bank on January 2000. The Bank’s president, James Wolfensohn, announced Stiglitz’s resignation in November 1999 and also announced that Stiglitz would stay on as “special advisor to the president”, and would chair the search committee for a successor. “Joseph E. Stiglitz said today [Nov. 24, 1999] that he would resign as the World Bank’s chief economist after using the position for nearly three years to raise pointed questions about the effectiveness of conventional approaches to helping poor countries”. “They’ll say the IMF is arrogant. They’ll say the IMF doesn’t really listen to the developing countries it is supposed to help. They’ll say the IMF is secretive and insulated from democratic accountability. They’ll say the IMF’s economic ‘remedies’ often make things worse – turning slowdowns into recessions and recessions into depressions. And they’ll have a point. I was chief economist at the World Bank from 1996 until last November, during the gravest global economic crisis in a half-century. I saw how the IMF, in tandem with the U.S. Treasury Department, responded. And I was appalled“. Around the world, protests against soaring food and fuel prices are mounting. The poor – and even the middle classes – are seeing their incomes squeezed as the global economy enters a slowdown. Politicians want to respond to their constituents’ legitimate concerns, but do not know what to do. In the United States, both Hillary Clinton and John McCain took the easy way out, and supported a suspension of the gasoline tax, at least for the summer. Only Barack Obama stood his ground and rejected the proposal, which would have merely increased demand for gasoline – and thereby offset the effect of the tax cut. But if Clinton and McCain were wrong, what should be done? One cannot simply ignore the pleas of those who are suffering. In the US, real middle-class incomes have not yet recovered to the levels attained before the last recession in 1991. When George Bush was elected, he claimed that tax cuts for the rich would cure all the economy’s ailments. The benefits of tax-cut-fuelled growth would trickle down to all – policies that have become fashionable in Europe and elsewhere, but that have failed. Tax cuts were supposed to stimulate savings, but household savings in the US have plummeted to zero. They were supposed to stimulate employment, but labour force participation is lower than in the 1990s. What growth did occur benefited only the few at the top. Productivity grew, for a while, but it wasn’t because of Wall Street financial innovations. The financial products being created didn’t manage risk; they enhanced risk. They were so non-transparent and complex that neither Wall Street nor the ratings agencies could properly assess them. Meanwhile, the financial sector failed to create products that would help ordinary people manage the risks they faced, including the risks of home ownership. Millions of Americans will likely lose their homes and, with them, their life savings. At the core of America’s success is technology, symbolised by Silicon Valley. The irony is that the scientists making the advances that enable technology-based growth, and the venture capital firms that finance it were not the ones reaping the biggest rewards in the heyday of the real estate bubble. These real investments are overshadowed by the games that have been absorbing most participants in financial markets. The world needs to rethink the sources of growth. If the foundations of economic growth lie in advances in science and technology, not in speculation in real estate or financial markets, then tax systems must be realigned. Why should those who make their income by gambling in Wall Street’s casinos be taxed at a lower rate than those who earn their money in other ways? Capital gains should be taxed at least at as high a rate as ordinary income. (Such returns will, in any case, get a substantial benefit because the tax is not imposed until the gain is realised.) In addition, there should be a windfall profits tax on oil and gas companies. Given the huge increase in inequality in most countries, higher taxes for those who have done well – to help those who have lost ground from globalisation and technological change – are in order, and could also ameliorate the strains imposed by soaring food and energy prices. Countries, like the US, with food stamp programmes, clearly need to increase the value of these subsidies in order to ensure that nutrition standards do not deteriorate. Those countries without such programmes might think about instituting them. Two factors set off today’s crisis: the Iraq war contributed to the run-up in oil prices, including through increased instability in the Middle East, the low-cost provider of oil, while biofuels have meant that food and energy markets are increasingly integrated. Although the focus on renewable energy sources is welcome, policies that distort food supply are not. America’s subsidies for corn-based ethanol contribute more to the coffers of ethanol producers than they do to curtailing global warming. Huge agriculture subsidies in the US and the European Union have weakened agriculture in the developing world, where too little international assistance was directed at improving agriculture productivity. Development aid for agriculture has fallen from a high of 17% of total aid to just 3% today, with some international donors demanding that fertiliser subsidies be eliminated, making it even more difficult for cash-strapped farmers to compete. Rich countries must reduce, if not eliminate, distortional agriculture and energy policies, and help those in the poorest countries improve their capacity to produce food. But this is just a start: we have treated our most precious resources – clean water and air – as if they were free. Only new patterns of consumption and production – a new economic model – can address that most fundamental resource problem. I find your article to be interesting, but how can one correct the problems, using the tools that helped to create them in the first place? Questions that should be asked: Has there ever been an equilibirum in food prices? If so, how can one measure this equilibirum? Once we do away with the concepts of equilibirum, patterns of consumption and production, only then will we be able to build a new economic model. That’s oversimplistic. There are plenty of poorer people in your ‘rich’ nations who are already unable to afford fuel and transport. A blanket tax would make life much worse for them, and the rich would just be able to get around it by paying their way out. And there are plenty of ‘poorer nations’ which, in their current state, would be absolutely incapable of handling any energy-systems we gave them simply because they are so badly misgoverned. We need a more multifaceted approach to the whole problem. As Stiglitz comments, we need brakes on financial markets. Then we need more rational ways of distributing food – for example, rather than having luxury out-of-season vegetables grown in Africa and feed Africans on imported Chinese rice, we need Africans feeding themselves. We also need to step on countries like Zimbabwe where it’s futile to bother growing food because it either gets confiscated or burned. And we need to get rid of the idea that goods should be built shoddily and frequently replaced. That’s one of the main environmental sins of modern commerce. And finally, we need to make international aid dependent on the acceptance of proper contraceptive education and use. What is the present outlook? In the US we’ve now had five months of employment going down and the number of hours worked has declined precipitously. If you focus on employment we are already in a downturn [whether or not it is technically yet a recession]. Is it likely that this dynamic is going to turn around in the next six months? Probably not. It’s likely to get worse. The best estimate on the housing market is that we are only halfway through the declines. Will tax cuts and sovereign funds come to the rescue? Since the introduction of tax cuts in the US in February, the increase in the price of oil has taken out of consumers hands more than twice the amount of the tax decrease. In the first round of the credit crunch banks could get money from sovereign wealth funds. Now there are stories that sovereign wealth funds feel the problems have been under-represented and that they are less welcome. They may still be willing to come – but only if they get a good deal. That means dilution of shareholders and loss of control. The price of oil has gone up fivefold since the Iraq war. But there is little incentive for producers to pump more now. If Goldman Sachs says the price is going to be $200 in a year’s time, you wait for a year and double your money. There’s another factor. [Producers] can’t really spend all that money that fast. What are you going to do with it? Put in the US, where the value of the dollar is decreasing and your funds may be frozen at any moment if you are declared a terrorist state? Or do you want to keep your money in the ground? Obviously you should do both, but the answer is pretty clear. Why were warnings of trouble ignored and who’s to blame? Too many people were making too much money. Those in the financial and real estate industries were making so much money they wanted to believe they were doing the right thing. There’s been a lot of self-deception. The Federal Reserve is very guilty. In a myopic way it decided to flood the economy with liquidity. People created a bubble to keep the economy going. It should have been very clear they were creating a bubble: when savings are zero, when people are giving 100% mortgages, when real incomes are going down and house prices are going up – there’s a disjunction there. It was a massive fraud, a pyramid scheme, arbitrage, financial alchemy, self-deception – call it what you will. This is the third financial crisis in three decades. The financial institutions argued that their genius in managing risk and increasing efficiency justified their high salaries. Many people are questioning that. They said they deserved to be taxed at low, low rates because they induced benefits that would accrue to all society. That’s being questioned, to put it mildly. Caught between a downturn and inflationary threats what should we do? We need to worry about inflation, but we need to recognise that we can’t stop imported inflation [of oil and food prices]. We can get the average inflation number down by killing wages so much that other parts of the economy have falling wages and prices. But that cure is worse than the disease. In effect what you are doing when you do that is putting the burden of adjustment on workers. [But] in the US real incomes have fallen already since 1999 for more than half of America. It’s extraordinary. Moderate inflation, under 8% to 10%, does not have any significant effect on growth. I would try to work on the idea of a new social contract. We are poor because of an increase in the price of oil – how do we share the burden? Let’s try to do it in a way that protects people at the bottom. The fallout from a combination of rising inflation and global recession seems inevitable: how can the world’s economies survive it? The world economy has had several good years. Global growth has been strong, and the divide between the developing and developed world has narrowed, with India and China leading the way, experiencing GDP growth of 11.1% and 9.7% in 2006 and 11.5% and 8.9% in 2007, respectively. Even Africa has been doing well, with growth in excess of 5% in 2006 and 2007. But the good times may be ending. There have been worries for years about the global imbalances caused by America’s huge overseas borrowing. America, in turn, said that the world should be thankful: by living beyond its means, it helped keep the global economy going, especially given high savings rates in Asia, which has accumulated hundreds of billions of dollars in reserves. But it was always recognised that America’s growth under President Bush was not sustainable. Now the day of reckoning looms. America’s ill-conceived war in Iraq helped fuel a quadrupling of oil prices since 2003. In the 1970s, oil shocks led to inflation in some countries, and to recession elsewhere, as governments raised interest rates to combat rising prices. And some economies faced the worst of both worlds: stagflation. Until now, three critical factors helped the world weather soaring oil prices. First, China, with its enormous productivity increases – based on resting on high levels of investment, including investments in education and technology – exported its deflation. Second, the US took advantage of this by lowering interest rates to unprecedented levels, inducing a housing bubble, with mortgages available to anyone not on a life-support system. Finally, workers all over the world took it on the chin, accepting lower real wages and a smaller share of GDP. That game is up. China is now facing inflationary pressures. What’s more, if the US convinces China to let its currency appreciate, the cost of living in the US and elsewhere will rise. And, with the rise of biofuels, the food and energy markets have become integrated. Combined with increasing demand from those with higher incomes and lower supplies due to weather-related problems associated with climate change, this means high food prices – a lethal threat to developing countries. Prospects for America’s consumption binge continuing are also bleak. Even if the US Federal Reserve continues to lower interest rates, lenders will not rush to make more bad mortgages. With house prices declining, fewer Americans will be willing and able to continue their profligacy. The Bush administration is hoping, somehow, to forestall a wave of foreclosures – thereby passing the economy’s problems on to the next president, just as it is doing with the Iraq quagmire. Its chances of succeeding are slim. For America today, the real question is only whether there will be a short, sharp downturn, or a more prolonged, but shallower, slowdown. Moreover, America has been exporting its problems abroad, not just by selling toxic mortgages and bad financial practices, but through the ever-weakening dollar, in part a result of flawed macro- and micro-policies. Europe, for instance, will find it increasingly difficult to export. And, in a world economy that had rested on the foundations of a “strong dollar,” the consequent financial market instability will be costly for all. At the same time, there has been a massive global redistribution of income from oil importers to oil exporters – a disproportionate number of which are undemocratic states – and from workers everywhere to the very rich. It is not clear whether workers will continue to accept declines in their living standards in the name of an unbalanced globalisation whose promises seem ever more elusive. In America, one can feel the backlash mounting. For those who think that a well-managed globalisation has the potential to benefit both developed and developing countries, and who believe in global social justice and the importance of democracy (and the vibrant middle class that supports it), all of this is bad news. Economic adjustments of this magnitude are always painful, but the economic pain is greater today because the winners are less prone to spend. Indeed, the flip side of “a world awash with liquidity” is a world facing depressed aggregate demand. For the past seven years, America’s unbridled spending filled the gap. Now both US household and government spending is likely to be curbed, as both parties’ presidential candidates promise a return to fiscal responsibility. After seven years in which America has seen its national debt rise from $5.6tn to $9tn, this should be welcome news – but the timing couldn’t be worse. There is one positive note in this dismal picture: the sources of global growth today are more diverse than they were a decade ago. The real engines of global growth in recent years have been developing countries. Nevertheless, slower growth – or possibly a recession – in the world’s largest economy inevitably has global consequences. There will be a global slowdown. If monetary authorities respond appropriately to growing inflationary pressure – recognising that much of it is imported, and not a result of excess domestic demand – we may be able to manage our way through it. But if they raise interest rates relentlessly to meet inflation targets, we should prepare for the worst: another episode of stagflation. If central banks go down this path, they will no doubt eventually succeed in wringing inflation out of the system. But the cost – in lost jobs, lost wages, and lost homes – will be enormous.